We’re over-ridden with zombies. Nazi zombies, super-speedy zombies, stripper zombies. There’s been a massive outbreak of the undead fellas in recent media, but one franchise that has stood out above the rest is The Walking Dead. Not content with being an acclaimed comic book series and an acclaimed TV adaptation with David Morrissey in, the series has recently branched into the world of episodic gaming. I recently snapped up the first season of the game when I found it heavily discounted on the PSN. 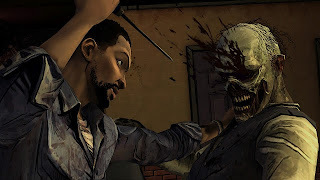 As convict-turned-zombie-slayer Lee Everett, The Walking Dead places the player in an original story set in post-zombocalyptic Georgia (if that isn’t a word, it is now). 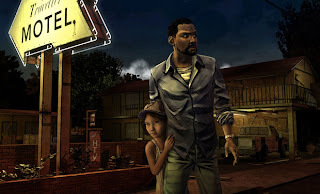 There’s a good variety to the gameplay; the player must investigate situations and solve puzzles – how to distract a street full of zombies so as to get to the key across the road, for example. As you’d expect from such a dangerous world, there’s also a fair amount of action sequences. The gameplay in the fight scenes is far from the best shooting in gaming. In fact, in the first few chapters, when it does show up, the controls needed are unnatural and awkward. The developers evidently listened to criticisms and fixed the trigger button for chapter 4 onwards (and had a shooting section right at the start to prove this). Nevertheless, this is not a shooting game, it’s a puzzle game, and the biggest puzzle of all is that of building your character’s relationships. Yes, what I like about this series is that, like the TV series, the games focus on character, building up characters and relationships that I really care about. Sure, in the first episode, I (and about 90% of players) chose to save Carley over Doug because she’s the hot one, but after another episode, it was becoming so much more complex than that. I was really starting to form complex opinions of all the characters – including to what extent I could trust them – that informed my decisions. And the decisions the player makes actually do seem to change the story. That’s often a problem in games – the game tells the player that their decisions are important, but it’s clear that any changes made are superficial, or alter nothing more than which of two final cut-scenes the player sees. A related problem is that games often give the player a 'right' or 'wrong' choice, with no grey areas, rendering the whole system rather bland and unengaging. I re-played BioShock recently and, as masterfully plotted as it is, it falls foul of these two errors. The Walking Dead, on the other hand, doesn’t. Though I knew the story would inevitably head towards certain plot developments, I really did feel that my choices were changing the way other characters acted, even which characters were part of my gang, and it was often difficult to decide what to do, which characters to side with – there’s a lot of grey area. Having to form these opinions and make these decisions meant that the game demanded emotional investment. I really started to like the characters to the point that the game had a profound emotional effect on me at two major points. The first came towards the end of chapter three. [WARNING: this paragraph has spoilers] Carley, a character I liked, was killed by the increasingly unhinged Lilly, who’d unfoundedly accused her of betraying the group. This sudden and traumatic loss was followed by the choice – do I bring the murderer back into the group’s truck to be judged, or leave her in the wilderness to die? Now, I usually try to do the 'good’ thing in games, but here, Lilly had genuinely made me angry, and I left her to die. I didn’t think “I think Lee would leave her”, I thought “I want to leave her”. That just shows how engaging the game is, how believable the characters are, how powerful character-driven games can be. And, even if my decisions don’t affect the major narrative flow and Lilly would soon have left the group by some other means, it still felt like this decision was important and resonant and revealing of me. But this was nothing compared to the gut-wrenching final scenes of chapter five. Really, anyone who doesn’t believe video games can tell effective stories should have seen the emotional wreck I was after that. I’m glad I was playing it late at night so no-one did. I love The Walking Dead on TV, but the game tugged at my heartstrings so much more. It’s so, so engrossing and powerful. And it doesn't even have David Morrissey in. 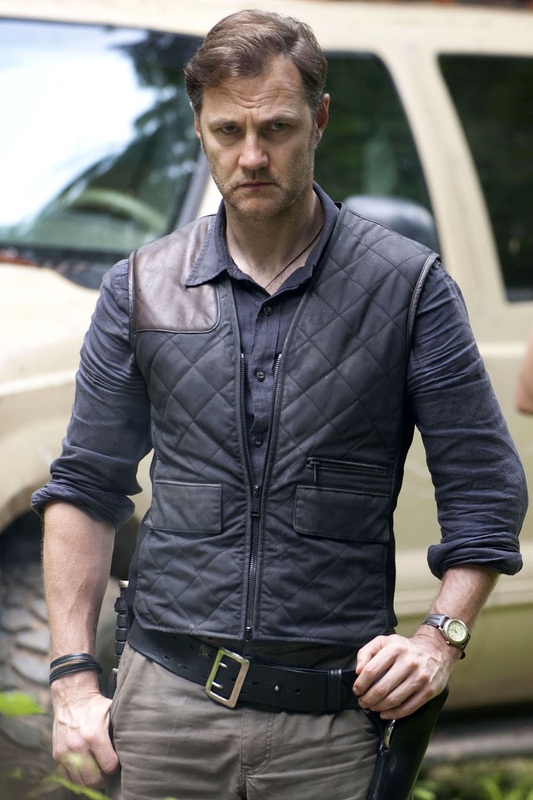 This is David Morrissey. He’s not in the game of The Walking Dead.